Main Street South, Brooklin, Ont. A black and white photograph of downtown Brooklin. This picture shows Baldwin Street (Main Street) in winter looking south from a point near the Lynde Creek bridge. 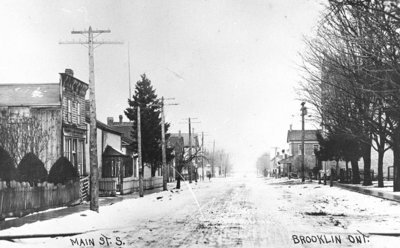 Main Street South, Brooklin, Ont., c.1909, Photographer Unknown. Whitby Archives 25_000_033.